Today we are getting crafty with sticks/twigs! 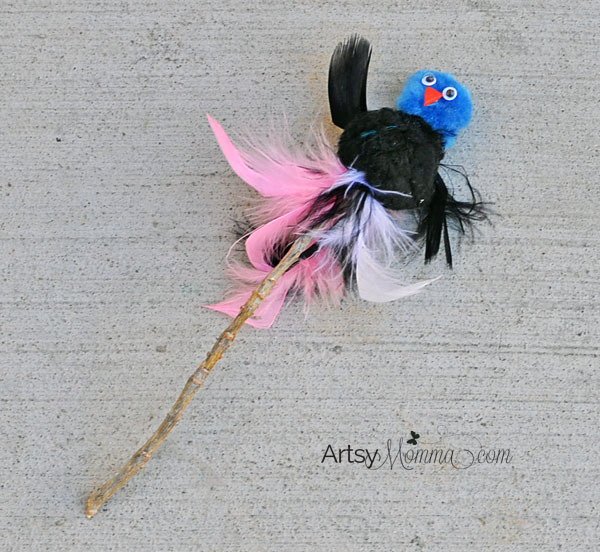 We made five DIY Stick Toys for pretend play and puppet shows. They are inexpensive to make using just a handful of supplies. 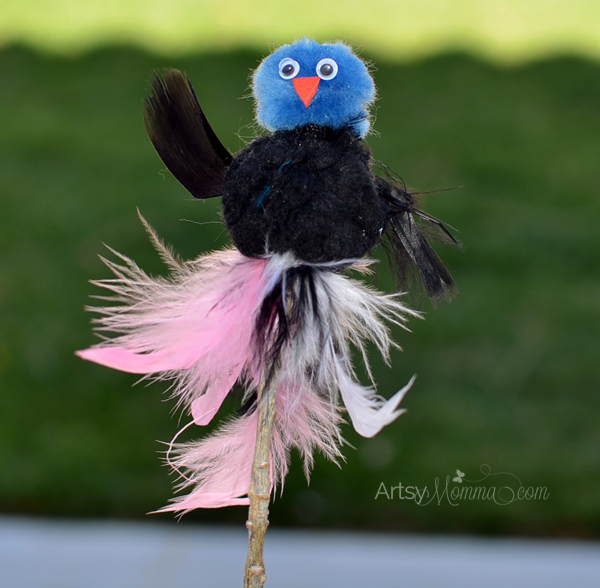 Read on to see how we made a k cup parrot puppet, a pom pom bird on a stick, a stick fishing pole and two crafty stick wands! We used a somewhat big pom pom for the body and a normal sized one for the head. Poke the stick though on both of these with the head being on top, then the body and then the remaining stick. 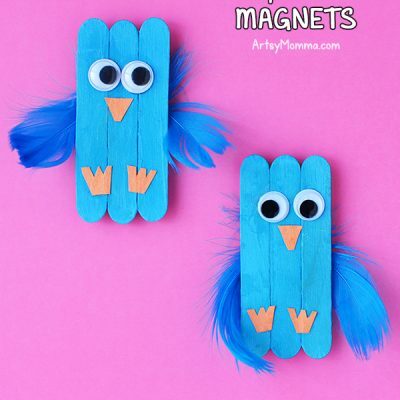 Use glue dot to stick on feathers, googly eyes and a beak. Hold the stick part in your hand for using it as a puppet. You could also use it as decoration in a potted plant or kids can stick it in the dirt/grass outside. Wrap the stick with yarn. Our yarn was multicolored. When you get to the end, tie a knot and then leave a long line of yarn to ‘hook’ the fish on to. 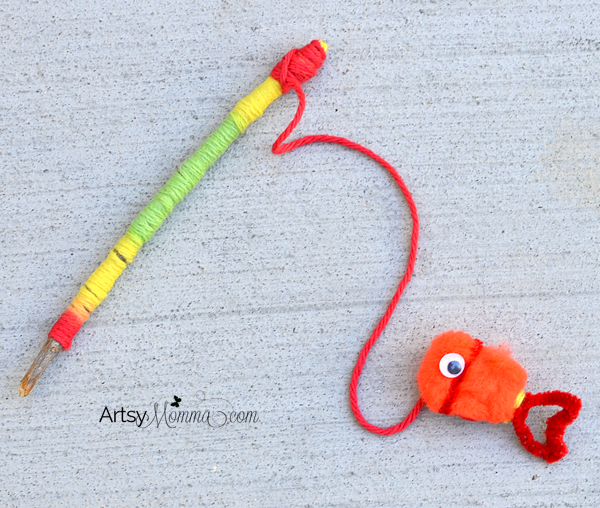 Wrap a pipe cleaner around a pom pom. Twist the two tails when they meet and then form a fishtail shape. Add googly eyes. Wrap different colors of string or yarn around the k cup. I found it helpful to add a few random glue dots to help hold it in place. You could also do a ring around the bottom and top of the coffee pod with low heat hot glue. 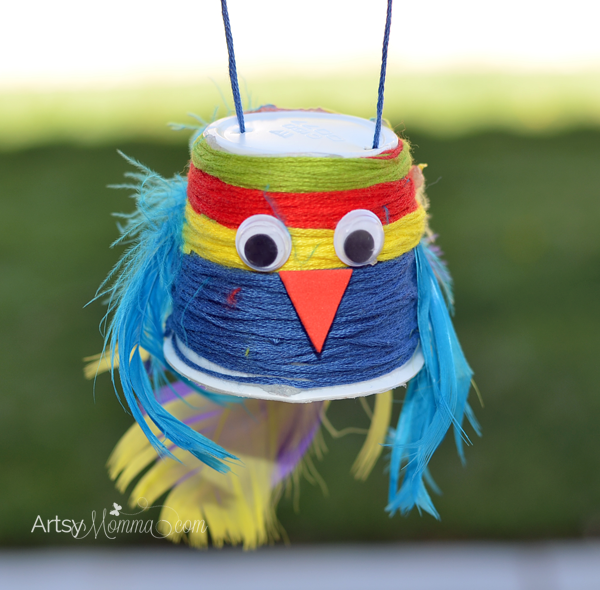 Use glue dots or hot glue to add on googly eyes, feathers and a beak. Use something with a sharp point such as a craft knife or large safety pin to poke a hole(s) in the top of the k cup so there is one on each side. Push a string through the cup and through the hole so it comes out on top of the bird’s head. Pull quite a bit extra length and wrap it a around a stick and then back down again through the opposite hole. Secure the two ends by tying them together. 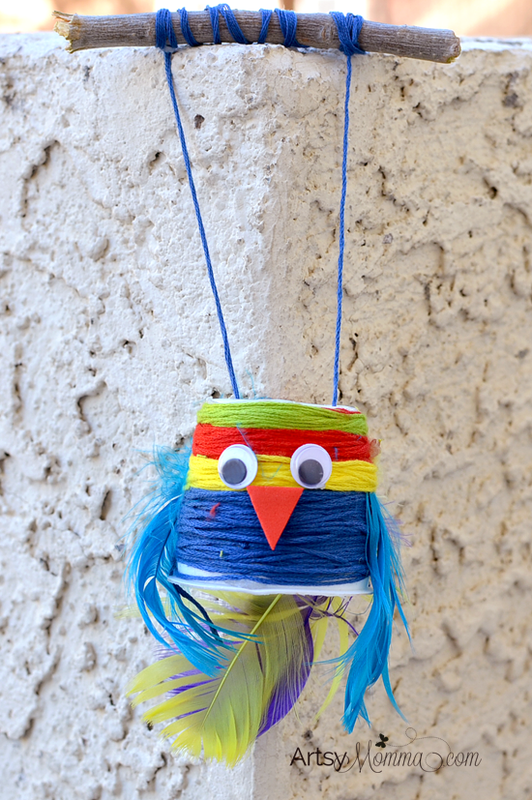 Hold the k cup parrot puppet by the stick for pretend play or putting on a puppet show. Little Sister uses hers as a pretend pet parrot which is cute. It could also be hung up on a tree branch, door knob and so on. We made a boy wand using our thickest broken tree branch we collected. 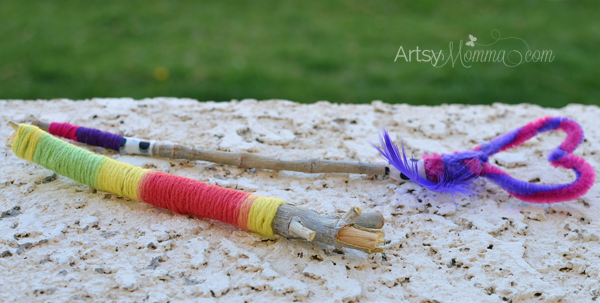 The multi-colored yarn was wrapped around the entire stick creating a fun design. For Little Sister’s wand, I formed a heart shape with half of two pipe cleaners. Then I wrapped a feather and the leftover part around one end of the stick to secure it. On the opposite end, I wrapped pink and purple string followed by a piece of polka dot washi tape on both ends. Other fun decorating ideas include painting it or adding glitter. Every month, we collaborate with a group of our crafty blogging friends to a do a kids craft challenge based upon the same craft material. 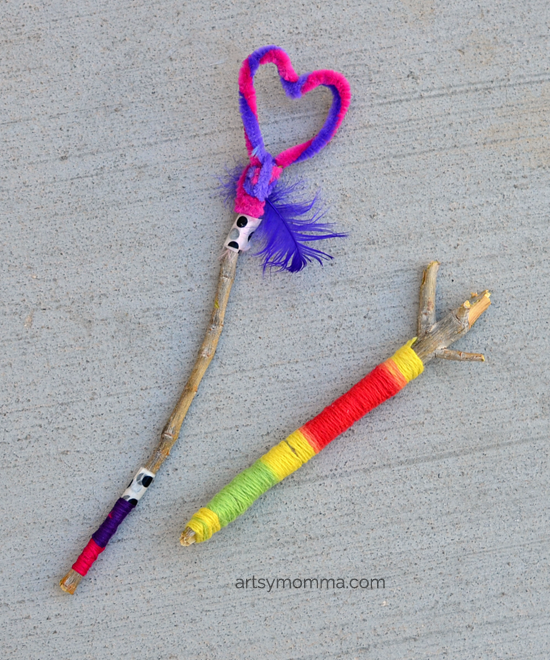 This month is all about crafting with sticks! 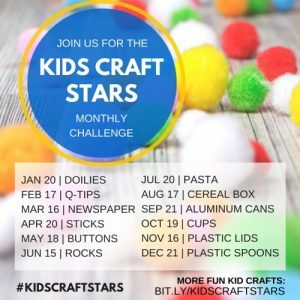 We invite you to share your stick crafts with us over on Instagram using the hashtag #kidscraftstars These could be popsicle sticks, sticks from nature, etc. 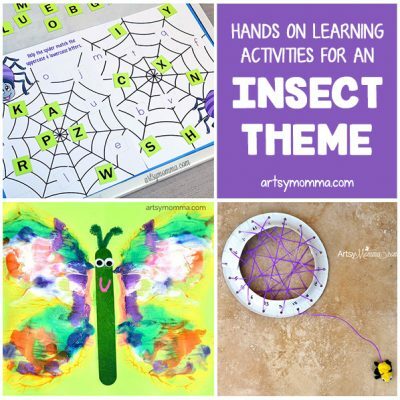 Excited to see your crafty ideas! 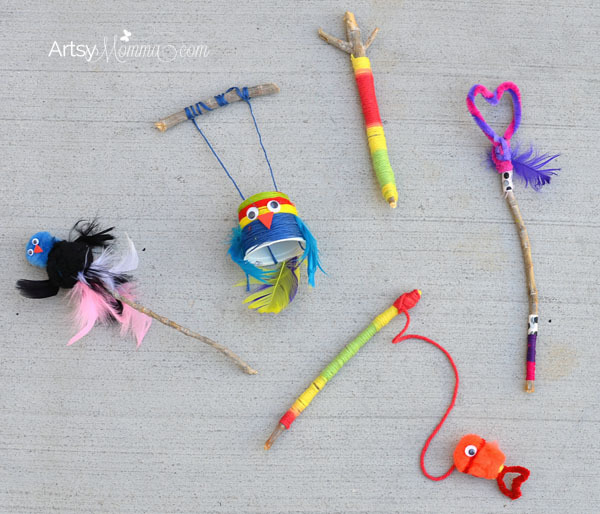 What fun ideas would you add to this collection of DIY Stick Toys?